63' Sunseeker 58 Manhattan motor yacht | Christian & Co. The vessel was inspected while hauled and afloat. Hull construction material is molded fiberglass. Deck is constructed of molded fiberglass and above deck structures are constructed of molded fiberglass. Coring is unknown. Bulkheads are constructed of unknown material (likely plywood). Overall condition of the hull structure appears good. The vessel’s weight is reportedly 64,200 lb. Exterior rails and hardware appear good. Cosmetic condition of vessel appears satisfactory – marginal externally and satisfactory internally. Vessel’s external colors are white and red with gold stripes on the hull. Below waterline through hull fittings appear satisfactory – good. The vessel is equipped with one manual and five electric/automatic bilge pumps that appear good and the bilge is holding minimal water. The ventilation system consists of engine room blowers and natural ventilation and appears good – excellent. General housekeeping appears good – excellent. The condition of the coring, in the stringers, deck, and elsewhere as applicable, is beyond the scope of this inspection. Engines’ external surfaces appear good and exhibit no rust or coolant leaks. Engine hour meters were not observed. Motor mounts appear good. Cooling systems appear good. Fuel systems and components appear good. Exhaust systems and components appear good. Electrical systems and components appear good. Engine control systems appear good and shaft logs appear good. Steering control systems is satisfactory – good and rudder ports appear good. Propulsion components appear satisfactory. Generator surfaces and motor mounts appear excellent. Generator’s peripheral components and systems appear excellent. Waste system and components appear good. General service seawater systems appear good. There is unknown capacity in two metal tanks located forward of engine room. Fuel tank surfaces, where visible, appear satisfactory (mostly inaccessible) and the securing mechanism appears good. The fuel fill, vent, feed and return lines and components appear satisfactory – good. Fuel shutoff valves are located at tanks and appear good. The AC shore cord, inlet and connections appear good. The AC wiring and outlets appear good. The AC main feeds are protected with circuit breakers. Battery arrangement appears good. DC wiring appears good. Circuit protection for the AC and DC branch system appears good. Wire terminations and connections appear good. Wire organization and arrangement appears good. Vessel has one 2001 halotron, one 1999 dry chemical, one 2002 dry chemical, and three 1994 dry chemical fire extinguishers. Vessel has a Fireboy MA2-1275 FE241 fixed fire suppression system with current certification. The safety components include: approximately 40 adult PFDs and two throwable PFDs; distress flares with expired certification; one anchor with chain rode that appears good. Navigational and anchor lights appear satisfactory (not tested). Other safety equipment includes: life sling, throw rope, emergency engine driven bilge pump system, fire blanket, air horn and a canister air horn. The vessel was inspected at its normal slip location. Line condition and arrangement appears good. Boarding hazards appear insignificant. All entry points are reportedly kept locked. Other security consists of marina personnel and locked dock gates. The vessel is fiberglass flybridge cockpit motor vessel equipped with two diesel engines and a diesel generator. The vessel was manufactured in Great Britain. The client purchased the vessel in September 2004 in Palm Beach, California. The vessel has just completed an eleven month refit which was performed at Baja Naval Boat Yard in Ensenada, Mexico. The client provided a list of items which were accomplished during the refit and they include installation of remanufactured engines, new (surplus) transmissions/V-drives, through hulls, steering pump, steering hoses, batteries, air conditioning components, bilge pump systems, engine controls, engine exhaust components, sanitation hoses, shaft seals, helm components and the refit included extensive sea trials and commissioning by Cummins. 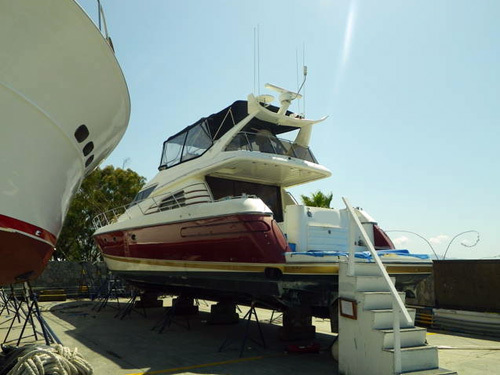 The client also provided a list of prior improvements including electronics, saloon entertainment, sanitation pumps, microwave, anchor chain, Flexiteak decking, interior carpeting, teak and holly soles and a repainting of the bottom half of the vessel. The vessel is basically structurally and mechanically sound. The engines were not test operated but the engines appear good, sea trials were performed by the engine installer and the vessel was recently operated from Ensenada to San Diego. The vessel is suitable for its intended purpose as a coastal cruising vessel. 1. The aft edge of the port strut was “ground away”, monitor and address as necessary. 2. Both propellers exhibit minor damage, more to starboard, repair the damage. 3. Both engines’ external intake screens were missing, reinstall the external screens. Both engines have internal sea strainers. 1. Maintain the portable fire extinguishers per N.F.P.A. recommendations. 3. Provide a secondary anchor and rode for use in two anchor situations or emergencies. 4. Display the name and hailing port per federal regulations. 5. Provide at least a short section of line in the bitter end of the anchor chain to allow emergency disconnection with a knife. 6. Properly secure the loose switch to starboard overhead in the engine room. The switch is labeled davit/crane. 7. There are seven conductors connected to one battery terminal on a battery aft of the starboard engine. Connect no more than three conductors per terminal and comply with A.B.Y.C. recommendations. 8. There is a hose connected to a discharge through hull to port aft in the engine room, the hose is plugged with a wooden dowel. Either return the hose to use or properly cap the through hull. 9. Service as a result of algae in the fuel filter bowl. Clean the fuel filter bowls and fuel as necessary. 1. There are numerous cosmetic deficiencies particularly on the deck and superstructure, address as desired or as necessary. Cosmetic deficiencies include discoloration and localized patches which are not well blended. 2. There is weathering about the windshield and some water damage below, address appropriately. 3. The vessel was not manufactured in America and components such as fuel hoses are not labeled per U.S. standards and regulations. Assure components such as fuel hoses and battery cables are suitable for this application, address if necessary.